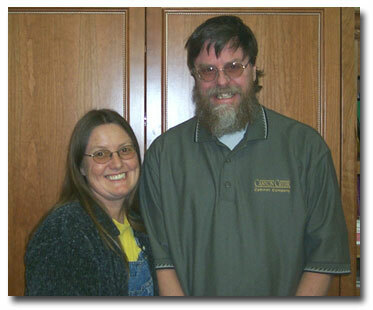 Larry and Kathie have been designing and building cabinets for over 20 years together. Their dream was to be self employed woodworkers since the day that they made their first bookshelf in their backyard workshop in 1975. Robinson Cabinets began officially in their garage in 1978, shortly after they moved to Independence. Their home schooled children grew along with the business and became skilled cabinet makers. Larry worked at several cabinet shops in the early days and eventually specialized in fire repair where he had to match existing cabinetry. Their custom cabinet business eventually grew to the point that they couldn't make cabinets fast enough to keep up with the demand and began to offer several different brands of manufactured cabinets as well as custom. Kathie never liked any of the manufactured cabinets until they found the Canyon Creek line, which they have carried exclusively for the last 10 years. With the arrival of the new Medallion Cabinetry factory in Independence they now offer a second fine line of manufactured cabinets as well as custom.